Imbue your decor with the chic charm and lovely comfort of this duvet cover set. The elegant ivory color complements any space, while the small decorative cotton tufts on the duvet cover and matching shams add a unique texture. The two decorative pillows add an extra touch of style, while the soft cotton fabric ensures comfort. Dimensions 92.0 In. X 104.0 In. X 0.13 In. This duvet cover set is EXACTLY what I wanted. Good quality duvet cover, pillow covers, and sham covers. Especially for the price! The throws were a little random in the sense that the color or style didn’t really match but still cute and nice! I ended up giving the grey throw to my roommate. Really lovely, soft duvet cover and pillow set. Ivory/cream in colour. I don't think small cushions go with the set well but giving them to a friend. Large (26 x 26") Euro cushion covers very nice but difficult to find inserts (28 x 28" - to give full fill) large enough! That is my only complaint. Cal King duvet stats very well in place in the duvet cover. No need for corner ties (at least for a feather down duvet insert that we have anyway). The set is great, the large pillow shams are a bit off though. I got two 26x26 pillows to fill them and they are a bit too small. Other than that I love the set! beautiful duvet cover and accompanying pillows and shams. I’ve been waiting for this set to be available in a Queen forever. I love the look of this comforter. The dots give it just the right texture so it’s not boring. I have this in my glam bedroom and it’s perfection. But it could be in any room and match well. I got ivory, which you could tie with any accent color. I choose to use varying shades of ivory/white. The duvet cover is also good quality. It’s not thin material that you can see right through. Many duvets are thin material and fray fast. This one won’t. This bedding set is beyond beautiful. 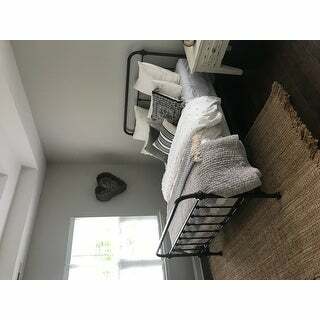 I bought this for my daughters shabby chic bedroom, and the set was beyond my expectations. The duvet has a natural wrinkle to it that fits right in with her "shabby chic" theme. Normally I buy all my kids their bedding at Pottery Barn, and this set from Overstock is by far superior in quality and value. I was super pleased that the set came with pillows and an extra euro sham. Couldn't be more pleased. Definitely the best purchase I have made on Overstock. I absolutely love my new duvet cover set. The quality is wonderful and it has that shabby chic vibe I was going for in my bedroom. As a great bonus, it came with matching pillows and shams. Highly recommend this product. Beautiful set for a great price. Was surprised by the quality of the duvet, as well as, all the shams - and the throw pillow. The color is definitely an off white which I didn’t notice in the picture but it works great with our daughters decor. Very pretty duvet cover - very nice off-white color with creamy tone. The only thing I would have changed is the two accent pillows as the grey does not match my decor, although, I don't plan to use them anyway. Duvet has corner ties for securing inside comforter. Very pleased! I LOVE this set! Make sure you buy a really fluffy duvet to fit inside or it will not be full like this. Also make sure your duvet is the same size as the cover. I bought a king duvet set and a king duvet but for some reason my duvet cover is a bit smaller than my duvet. Love Love. The opposite side of the duvet cover is so soft. Love the look of the Pom poms. Adds a nice texture to my rustic master bedroom. Love this set! Purchased for my daughter's college apartment and it is beautiful. Fabric is slightly textured creating a rich high end feel. And best of all, it has held up, including the "tufts" through many washing! I am planning to buy a second for my guest room!! This bedding looks great and is a great deal for the amount of pieces that you get. Quality and look are great. Shipping took a little longer than most things I order from overstock but worth the wait. The white duvet cover is very nice and looks clean. Lots of compliments on this style. The euro pillowcases fit two standard pillows and looks nice. I was a little worried this would look too "little girl" for our master bedroom, but the fabric is really nice and comes off very clean and elegant. We traded out a couple of the more decorative pillows for something more muted, but are absolutely thrilled with the update. One thing to note - it is a touch more ivory than bright white. I absolutely love this duvet cover set. 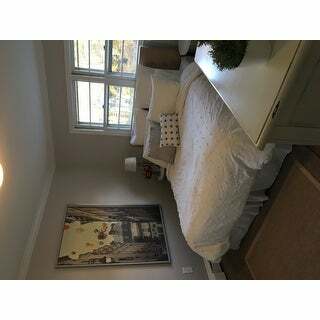 It is exactly as pictured and looks beautiful in my master bedroom. Will definitely be purchasing other items from this brand! great combination and looks beautiful in the bedroom. Looks very nice on the bed. Totally instagramable. Love the price and quality of the cotton! Very happy with product! When I opened this up I immediately noticed an awful smell. I thought it might just be the cardboard box so I continued to open the plastic bag the duvet and pillows were in. It too smelled horrible. I’m hoping once I wash everything it will be gone. The throw pillows smell and I’m not sure if I should try and wash or just throw out. I hope you can fix whatever it is that’s causing this issue. This duvet set is beautiful ,it is very very classy we are complemented on it all the time.its made of nice material, not to heavy and its very easy to remove and clean. I absolutely love this set. Its great quality and super comfy. It has ties in the corners to hold your insert in place and the closure has hidden buttons. It was a little tricky to find the opening at first but its much better than a zipper I can feel. "Will this be back in stock in the twin size anytime soon?" "is it suppose to come stuffed? it seems like a summer blanket its so thin, kinda wanted to send it back, the pics looks like it would be a thick fluffy blanket, nope not at all not fluffy at all." This is the duvet cover only. It would need to be stuffed with a duvet insert. "Is the back side of the duvet also 100% cotton?" The fabric on the face is 100-percent cotton. "How well does the duvet insert stay in the duvet cover? (i.e., are there ways to attach it, or does the insert move around a lot?)" There are corner ties to hold the duvet in place. There are ties inside each of the corners that secure the duvet insert in place. This is an awesome duvet cover. I love mine! Yes, It has ties on all 4 sides which ensures a great fit. "I just got this set, but I would love to have 2 of the small polka dot pillows. Is there a way just to buy that one pillow?" Unfortunately no, the pillow is not available separately. "Is the duvet in the current photo Ivory or white? Thanks"
"I would like to purchase a boxed bead skirt to match this Urban Habitat Maize Ivory Cotton Jacquard 7-piece Duvet Cover Set. It looks white in the picture but lists ivory. Can you recommend a box skirt that will match the color."